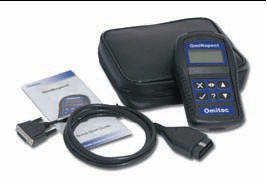 The OmiNspect is a compact hand held EOBD (16 pin plug only) diagnostic tool. 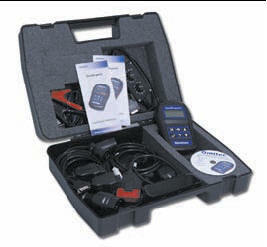 It allows the user to quickly and easily diagnose all EOBD compliant vehicles. Much like the ACT-III is also CAN enabled, letting you to diagnose all the latest CAN-based vehicles. It allows the user to read and clear fault codes, read and capture 'Live Data' and perform manufacturer test routines where supported by the vehicle. One job = One diagnostic solution! Ideal for the specialists only wanting a single application tool e.g. Fast Fits, Body Shops, Servicing etc. etc. Great for new workshops starting out in diagnostics. Cost effective alternative to having a 2nd full diagnostic kit in the workshop. 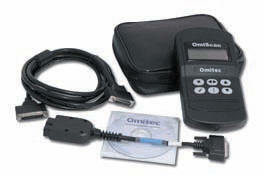 OmiNspect EOBD - OmiNspect EOBD is a Robust, self-contained, hand-held EOBD scan tool. It reads and clears fault codes, accesses live data, freeze frame data and covers all modes of EOBD. It also contains a comprehensive vehicle specific fault code library. OmiNspect EBP Electronic Parking Brake and ABS - OmiNspect EPB (Electronic Parking Brake) is designed to allow the modern workshop to open brake callipers to replace brake pads on a growing number of vehicles with electronic handbrakes. It will also re-calibrate systems where necessary. 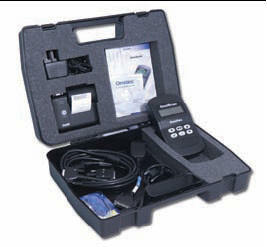 In addition, it is designed to allow the technician to read and clear ABS faults. OmiNspect Service Reset - The OmiNspect Service Reset enables the resetting of service lights on a vast number of vehicles including the latest BMW CBS systems, Mercedes Assyst Plus, Fiat and VAG variable service reset. This is an excellent tool for the service garage that would normally have to take the vehicle to the local main dealer centre just to have the service light turned out. 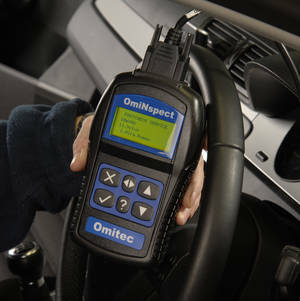 OmiNspect Climate Control - OmiNspect Climate Control enables a technician to read and clear faults in climate control systems on a large variety of vehicles. OmiNspect Airbag - The OmiNspect Airbag unit enables a technician to read and clear faults, and also reset airbag and SRS warning lights. This tool is well suited to body shops. OmiNpsect TPMS Tyre Pressure Monitoring (Supplied with OmiDetect) - A ‘must have’ for fast fits or indeed any garage who change and re-fit tyres. This tool is designed to program the TPMS ECU and register new valve or re-registering valves if wheels have moved into different positions. Need more than one application? All the features of OmiNspect Basic but has added FastCheck functions. FastCheck allows warning lights and fault codes to be cleared on ABS, Airbag, Climate Control systems As well as Service Reset including the latest CAN systems used by VAG. The OmiScan is an stand alone unit that you can take on the road. It also has PC connection capabilities, so you can review stored data later. The CAPS software enables you to go deeper providing suggested diagnostic tests that should be carried out to remedy the problem. Truly modular equipment to which you can add on vehicle applications & connection cables to expand the range of vehicle makes you work on. Rugged EOBD (only) fault code reader with 'live data' that can easily be expanded at your own pace. CAN enabled and PC ready. All the features of OmiScan Basic but has added FastCheck functions. FastCheck allows warning lights and fault codes to be cleared on ABS, Airbag, Climate Control systems as well as Service Reset including the latest CAN systems used by VAG*. * Additional leads will be required to cover all systems. OmiScan Basic with an extensive suite of 26* vehicle manufacturers and FastCheck software. Supplied with EOBD cable, J1962 Universal Multi-way harness, PC cable, portable thermal printer and CAPS software enables use on its own or with a PC. * Additional leads will be required if you want to upgrade to cover all vehicle systems. Everything that is OmiScan Essential but also supplied with a full compliment of harnesses for pre EOBD vehicle applications. CAPS technical data is supplied as standard and when used with the handset and an PC, links the fault codes to suggested tests. The connection to a PC also allows 'live data' graphing, record and playback to be viewed. The first level upgrade kit contains a full suite of manufacturer specific software, FastCheck and CAPS. Also includes a thermal printer, printer harness, power supply, PC cable and J1962 universal multi-way harness. 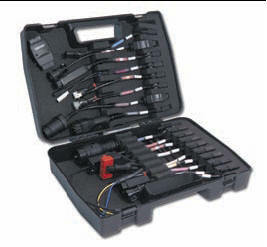 The upgrade kit that contains everything to take you from the OmiScan Basic to OmiScan Full kit, supplied in two dedicated carry cases. 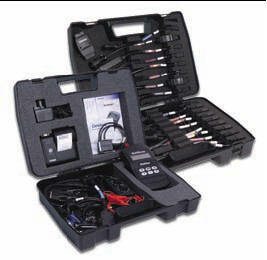 The full set of pre-EOBD application harnesses to cover all applications supplied in a sturdy carry case.